Izzy Norris, Farm Youth Apprentice at Swansea Community Farm, decscribes HRH Prince of Wales’ visit to the farm which included a tour around a BIG-funded building. I spent most of the morning in the play area with the kids awaiting the arrival of Prince Charles which would have been a lot less arduous were it not raining extremely heavily. 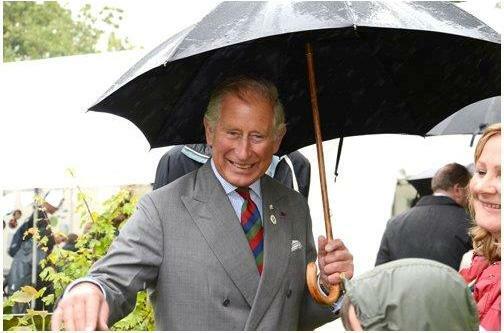 (Presumably the farm had laid the weather on specially so that we could show off the bright yellow farm waterproofs that came from In Kind Direct – one of the Prince’s main charities that provides us with lots of useful stuff.) Nevertheless we are Welsh, and we are hardy farmy types, so preparations continued as though the weather wasn’t even the slightest bit annoying or inconvenient. Across the farm, compost was turned, grain was ground, the pond was dipped, and (apparently very tasty) welshcakes were made. The beekeepers bee-suited up, and the teenagers managed to light a fire in the fire pit even in pouring rain. All the dignitaries gathered and gossiped in our lovely new cafe that we finished building in June. Meanwhile the kids built an enormous den in the play area, but lost interest in it as soon as they observed men in suits (very suspicious), and reasoned that the Prince must be here. Then they pointed at every single man in a suit and demanded to know if that was him. Clearly the royals need to raise their profile as they are, apparently, quite inconspicuous and unrecognisable. Consensus was that the Prince ought to be wearing a gold crown and a red velvet cape, and also that he should be constantly surrounded by trumpeters and musketeers. When he did arrive, he was sporting neither crown nor cape, yet the children were utterly in awe. The Prince asked them a lot of questions about their den and their play area, and was very impressed by how tall said den was. At which point one of the younger ones, quite adorably, tugged at my coat and asked when Prince Charles was going to get here. And then, just as the Prince was about to leave for the rest of his tour, the rest of the kids waylaid him by asking what he was having for his tea. He consulted his private secretary – fish, apparently. You heard it here first. Afterwards, we all went to watch the Prince unveil the commemorative plaque on the wall of our very lovely new cafe. 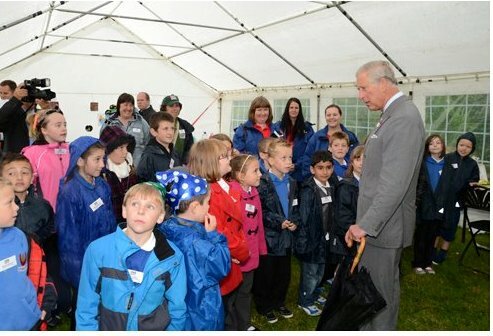 Which is when the kids decided that, although Prince Charles was not dressed like an actual Prince, he was still quite nice – and knowledgeable! He clearly knew a lot about dens, which is why he was so impressed with theirs, because he recognised the hard work that must have gone into it. It was definitely worth waiting around in the rain to have your den validated by such a high-ranking den-expert. In all, it was a great day for all involved – and afterwards we all piled into our very, very lovely new cafe and sampled all the yummy things that our resident chef and his army of volunteers had spent the day making. The café was funded through the Big Lottery Fund’s Jubilee People’s Millions programme which celebrated the Queen’s diamond jubilee. £60,000 was secured following an ITV promoted public phone vote in June last year and since January over 35 regular volunteers have put in thousands of hours to complete the project. ← Does well-being mean well funded?